leyton.org – Running. Cycling. Tech. Glasgow. Community. Beer. Combinations thereof. I get asked a few questions quite regularly about parkrun in Scotland. One of the main ones is “Why the 9.30am start?“, and it certainly came up in many of the lovely chats I had with people about the course today. It’s also probably the main difference for parkrun in Scotland (and the island of Ireland) compared to the England and Wales. So, there are two reasons for the 9.30am start time at Glasgow, now Pollok parkrun, which was the first parkrun in Scotland. Firstly, well, Pollok park is a tree lined park. I was looking to do setup at about 7.30am – cycling from home and putting the signs up (always the reverse of route), before returning to collect my car with the kit (we eventually needed a few traffic cones for our finish area, and they’re heavy). We’re actually considering a later 9.30am start simply because the sun rises 40 minutes later here in the depths of December. Add the heavy tree cover in some parts of Pollok Park, as well as the gorgeous Glasgow weather, we’d been thinking it’d make sense to set a slightly later start time, at least in the winter months. But there’s an argument (for sheer simplicity) to stick to one time all year round. Re start time, there is something to be said for a regular start time throughout the year so I’d be tempted to make it 9.30 throughout the year, but it really depends how busy the park gets during summer at about 10.30. I’d say start with it at 9.30 and keep it under review. If you later decide to say Winter 9:30 GMT, Summer 9:00 BST then that’s always an option. It was always at the back of my mind how much darker it’d be for any time trial/parkrun that started further north, if another community ever wanted one. I’d not visited anywhere much further north in the winter at that point, but I had a rough idea after a few winters in Glasgow just how dark it can get/feel in the depths of December. I’d also less awareness of what other city parks were like at the time, so figured they’d be at least as dark and foreboding, and fiddly to setup, as Pollok’s North Wood. Secondly, the proposed event was to take place in the North Wood of Pollok park, which is just behind the Burrell collection, so there was a perfect post-run coffee venue to hand. But it opened at 10am. I was very worried about how – or even if – the community/atmosphere of the events I’d enjoyed (Bushy park time trial (now Bushy parkrun), and Richmond park time trial (now Richmond parkrun)) would develop if we had a 9am start, with most runners finishing about 30 minutes before the cafe opened. They’d simply go home rather than hang about. So, we’d have no easy post-run natter spot, and the event wouldn’t flourish. We’d then struggle for volunteers. It’d be hard work. So, a 9.30am start would fit perfectly with the venue schedule, and would help foster the community. It’s just important – certainly after parkrun grew beyond the 10 UK events it had at the end of 2008 – to remind Scots travelling south so that they don’t miss the local parkrun. Tourists who visit Scotland over the summer, or people who catch national publicity, do sometimes arrive for an earlier start. Alas the difference in start times doesn’t get spotted (assuming it’s stated!). But that’s it really. We stuck with it, and didn’t really ever consider revisiting it. Dark parks in winter, and the need for coffee and cake, that was important to build the community, and it all just fitted. It felt right, and works well with other park venue opening times around Scotland. The full set of pictures are available via this shared album link to Google Photos. A selection of my favourites below. Pictures were taken by Paul Flood. Alas Paul was the first Scot to discover that taking pictures of fast moving runners, in a tree lined park, was a lot trickier than we expected. It was also very cold. Nick Reid as funnel manager, and Frances (our pretty-much ever present volunteer) on timer. – A couple are from after the first event (The C3 car and Burrell picture). Let’s call it artistic license. I’ve been doing some work recently to gather my various notes and thoughts together about the start of parkrun in Glasgow and Scotland. In the pre-social media days, I used to maintain this website as a full on blog. Alas it got to become a bit too onerous, and I took it offline around 2011. Whilst it’s back again in this form, I always knew I’d want to pull some of the old content through again at some point. (4/n) Come on folks… https://t.co/rT5yOxsMXd – Although it has more dramatic effect if you start mid-way down and work back up. (12/n) So by way of explanation, I’d taken down my blogging website in 2011 or so: I felt, and still do, kinda weighed down by it (this was all pre FB/twitter). (14/n) I’m immensely indebted to @mrsfunkin and @davidmrowe who introduced me to it all in the first place. Also, as the ball started rolling, the support and gentle nudging from Crispy in his then new role as general manager. Picture by Paul Flood, used with permission. Some years ago, I did a lot of photography (even a couple of weddings). Over time, however, I gradually found the iPhone in my pocket took over by sheer convenience: the sheer bulk of my Digital SLR camera, plus lenses, meant it started gathering dust in my cupboard. A few months back though I began thinking it was time to revisit this: Frances and I often found we wished we had “a decent camera” for one reason or another, but I was aware the specifications of my D-SLR were some years behind (resolution, not least; also features). Plus, well, bulk. I finally decided to throw some of my gadget savings at something: A coin pot at Monzo, and savings from ensuring I bring lunch to work, rather than buying it at the canteen soon add up. So after a lot of research, I opted for the mirrorless format: all the flexibility of SLR, without the bulk: Just what I was after. I was swung by The Wirecutter review to opt for a Fujifilm X-A5, combining flexibility, loads of new features, decent press-and-forget buttons for those “capture the moment” needs. Anyway, love it to bits, and have setup a photo album on Google Photos for various experiments and snaps I have taken (not necessarily with the new phone though), that I like. Some also feature in the header pictures on the site. 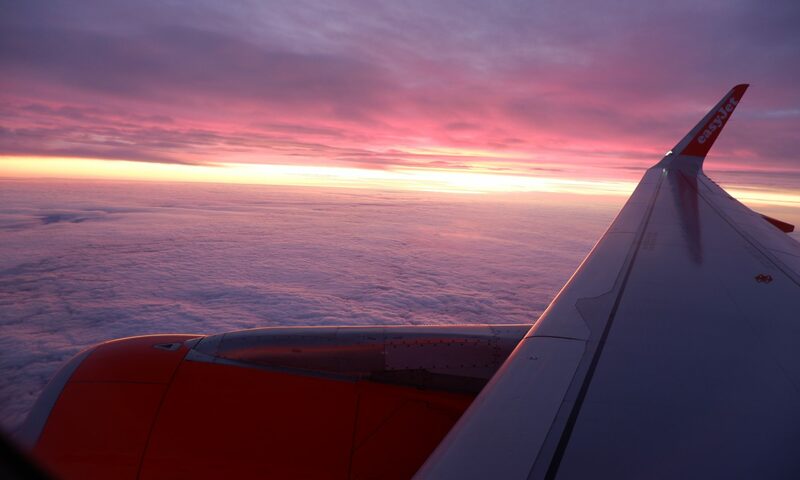 “Sunset” – On a flight to Bristol the sunset was stunning, so spent a good 20 minutes attempting to snap out of the window to capture it. There were better colours than ‘Sunset’ shows, but I struggled with the light settings and focus. “Priddy Nine barrows”, and “Early morning” – On a run around Priddy (route is on Strava), I was fortunate to see some beautiful misty views that just took the breath away. I do love the feeling of achievement, fitness and progress from running, but to be honest it’s as much mornings and views like this too that make getting up early so worth it. “Japanese figures” – first experiments with the camera playing with focus. We picked these guys up when we were in Japan in 2004. We’re currently pondering a repeat visit, perhaps in 2019. Wrote a piece about the organisation of the Bellahouston Mob Match, and finally posted it over at the club’s website. Really hoping a few other clubs up here might be tempted to give it a whirl, and wrote this ‘recipe’ with that in mind. Also useful reminders for next year’s version! My friend Maz pinged me a link earlier today to an Evening Times article titled “Glasgow bike project wants cyclists to help map city routes”. Seems to be a re-run of a project the council ran last year, which I’d half-heartedly tried to take part in. The main… challenge for my participation last year was they’ve partnered up with Naviki. Whilst I’m sure it’s a lovely and wonderful service run by wonderful people, alas it’s not an app/site I’d come across before this project: from a bit of a poke about seems to have a bit more traction on mainland Europe than here, where it’s pretty much all Strava in my experience. Hi @Naviki! – I'd love to do the @glasgowcc ride tracker thing. It uses your app. BUT I already use a GPS tracker. Any chance you could either add support for bulk upload of GPX to your website, OR open up/send API details for tapiriik integration https://t.co/feHtrZxnb8 ? So I’d sort of uploaded some of my rides (all of which I log with a few presses of my watch; it’s not a faff to do this), but not all of them. I’m keen to help show the council there’s plenty of us out there cycling when they try things like this, but my time and patience is/was a bit limited. The larger question though is why are the council doing it this way anyway? @BikeGobGlasgow pointed this out here, Strava already make a lot of data available, for free – see the Glasgow heatmap here (street level detail needs a login). But they also have (paid for) services available to bodies/organisations such as councils to access anonymised ride data. I know one of the arguments might be that us Strava/Garmin users are already likely to be quite engaged with cycling, and are may be a bit self-selecting, which may not make it representative. Along the likes of ‘new protected cycle provision isn’t for people who already cycle, it’s for the people who aren’t yet comfortable doing so’. However, I still rather doubt there’s a huge advantage using data sourced from (I fear) slightly patchy adoption of a clunky/special app involving various degrees of faff, over the richer, and more widely adopted Strava platform might offer – which would certainly average out to a good usage indicator. Back in June I attended a meeting of Friends of Pollok park. From my time establishing Pollok parkrun, it’s a group I’d always hoped would appear: It’s a stunning park, and in the climate of cuts and reduced expenditure, really would benefit from an advocacy group to work constructively with council, park managers, and nearby groups/organisations to support the park. The council is helping support it, but the attendance at the June meeting was a bit… sparse. So I got home and registered a few domains (friendsofpollokpark.com), popped a basic Hugo site together, and got in touch with the owner of the current facebook group to get some of the content updated. A month later, and a big uptick in the number of followers on the facebook group, the next meeting was standing room only. A fantastic result, and shows what social media can help achieve. Fingers crossed it’ll help get things progressing. Slightly tricky part is the group is in a bit of an odd place just now: The council is trying to help the group to form (as an unincorporated group), so it can move forward under it’s own committee. Understandably attendees want to raise many of the issues with the park and see it progress, but it’s hard to see that happening without a committee making decisions and working with members. Hopefully the next few weeks will see some progress and an enthusiastic park user or two taking on the fantastic challenge to form a much needed advocacy group in the community. So after a few years away, I decided it was time to polish up my online profile. Currently starting to look about for new work challenges, and have started explore some new roles, opportunities and challenges. All quite exciting. More will undoubtedly appear here as I get the hang of things, and rediscover my voice.